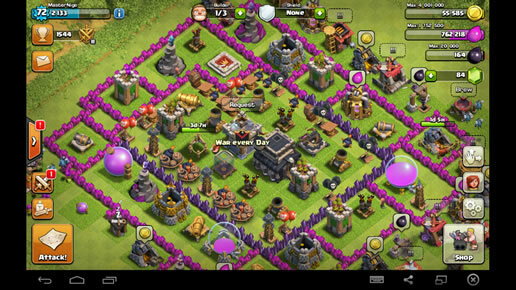 Download clash of clans shield for all those people that use bluestacks app player on their PC. It is important you click the correct link for the operating system you have got because this is a downloadable app there are no refunds. Well once installed it will connect and put you online every 280 seconds. So you know every 5 minutes clash of clans will start up. As we all know you cant be attacked while online. So this is by no means a permanent shield but it is as good as. This way when I am not playing on clash of clans it still starts up and looks like I am online. This way no one can attack me. As you may all now when you start clash of clans if you have not done anything on it for a while it makes you inactive. This software combats that. Imagine this you have been saving all your gold to buy something then you pop out to get a drink. Suddenly while getting your drink you are attacked how frustrating is that. You can loose hundreds of thousands in gold. Well no need for that to happen with my clash of clans shield it will give you some protection. The only downside I have come across is that when you have been playing to long sometimes you get a message come up and tell you, "Take a break" Your shield cant help you there. But as soon as that time is up you know within 280 seconds clash of clans will start up again. As stated by my copyright you do not have any reseller right to this software. You purchase 1 copy for your personal use. You can see from the image obove you get the option to start and stop the shield when ever you want. The shield timer is set to countdown from 280 seconds. This was based on much testing and provides you with the best shield possible. At the same time using as less of the computer resources as possible. So once the timer get's down to "0" it will simply restart the timer. When the timer restarts clash of clans will start.